Many countries have a rich tradition of domestic travel and holidaying which not only predates but exceeds mass international travel. This is particularly the case in Asia where recent economic prosperity and trends in globalization have not merely spurred, but continue to shape traditions in domestic tourism. 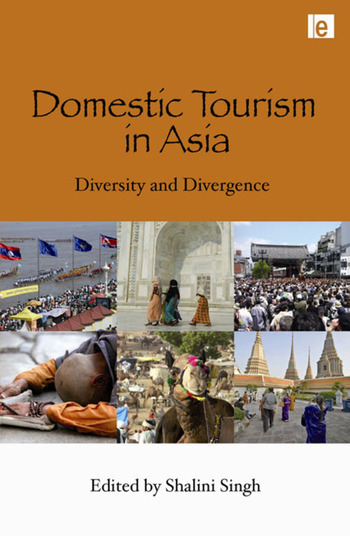 This book is the first to address specifically the continuities and changes in domestic tourism in Asia. It explores the ethos of domestic travel and holiday-making in order to understand the distinctive common strands that underlie conventional and contemporary tourism practices, against the local and global backdrop. A considerable range of countries is covered in the case studies, including those with patrimonial histories, namely China and India, the economically developed nation-state of Japan and the microstates of Taiwan, Singapore, Macao and Hong Kong, besides the coastal countries of Malaysia, Philippines, Laos and Vietnam, as well as the land-locked countries of Kyrgyzstan and Mongolia. The book presents some of the many interfaces of Asian cultural and natural heritages with tourism, while giving due considerations to today's political and economic realities. Shalini Singh is Associate Professor in the Department of Recreation and Leisure Studies, Brock University, Ontario (Canada). She is also the Executive Editor of the international journal Tourism Recreation Research (Centre for Tourism Research & Development, India).